It’s 1942 and the Nazis are racing to be the first to build a weapon unlike any known before. They have the physicists, they have the uranium, and now all their plans depend on amassing a single ingredient: heavy water, which is produced in Norway’s Vemork, the lone plant in all the world that makes this rare substance. Under threat of death, Vemork’s engineers push production into overdrive. 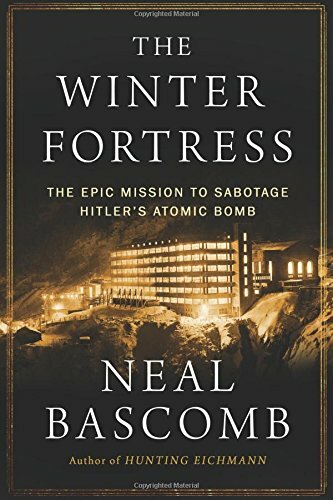 Based on a trove of top secret documents and never-before-seen diaries and letters of the saboteurs, The Winter Fortress is an arresting chronicle of a brilliant scientist, a band of spies on skis, perilous survival in the wild, sacrifice for one’s country, Gestapo manhunts, soul-crushing setbacks, and a last-minute operation that would end any chance Hitler could obtain the atomic bomb—and alter the course of the war. This narrative is truly a story of epic survival. 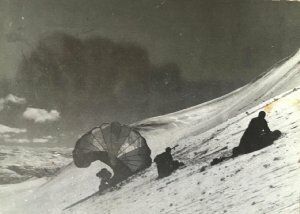 With rudimentary equipment, the saboteurs dropped by parachute into Norway at a place called the Hardangervidda, where they then lived for months before their operation began. The 3,500 square mile high plateau had no roads, no permanent habitations. Many stretches were barren, lifeless hillsides of broken scree, one mile indistinguishable from the next. On the Hardangervidda, Norwegian legends said, it could grow cold enough, quickly enough, to freeze flames. While there, the team maintained wireless radio contact with London, and their cipher messages speak of terrible blizzards, starvation, desperate hunts for reindeer, and an indomitable spirit to survive in face of such conditions. WWII is an era I’ve been captivated by for some time. The thought of men and women putting themselves on the line for what they believed would save the world is mostly a long gone thought. Without the technology and comforts we have today, it’s truly remarkable what they put themselves through to make the world what it is today. The Winter Fortress tells the story leading to this point in history very thoroughly, no detail left unturned.